Join CEL Executive Director Stephen Fink for an introduction to our nationally acclaimed instructional framework called the 5 Dimensions of Teaching and Learning™ and to our teacher evaluation companion tool – the 5D+™ Teacher Evaluation Rubric. 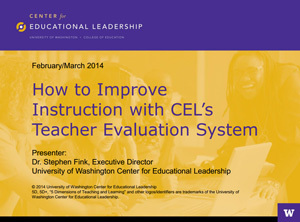 In this recorded webinar information session, "How to Improve Instruction with CEL’s Teacher Evaluation System," Dr. Fink discusses the tools and a variety of consultative services CEL offers to support the implementation of the framework and teacher evaluation instrument. Dr. Stephen Fink is the executive director of the University of Washington Center for Educational Leadership (CEL), and affiliate associate professor of educational leadership and policy studies in the University of Washington College of Education. 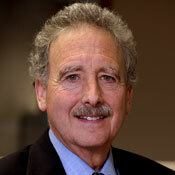 Dr. Fink has worked extensively with school and district leaders on improving the quality of instructional leadership. His work has spanned large urban, suburban, rural and charter schools and management organizations across the country. In addition to directing CEL, he provides facilitation and executive coaching for superintendent and district-level leaders in a number of CEL partnerships. Prior to coming to the University of Washington he spent 12 years as an assistant superintendent in the Edmonds School District (Wash.), and was a principal and special education teacher in Idaho and Los Angeles. Dr. Fink is the co-author of Leading for Instructional Improvement: How Successful Leaders Develop Teaching and Learning Expertise.